As a board member, volunteer and vendor of the Sacramento Tree Foundation, I had a blast helping to invent this tree. At 3 feet tall (and wide), it holds ‘pledge leaves’, paper cutouts of leaves with contact and commitment information from donors. 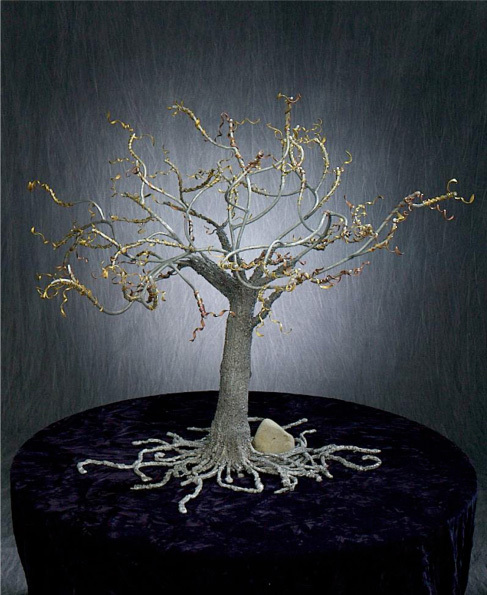 The Tree Foundation uses it at public outreach events and cultivation events, and it is a stunning piece of art with a fabulous purpose. For me was the whole process was fun: hearing a request for ‘a tree that hangs on the wall’ and envisioning it to be something grander and more dynamic; finding a sculptor — Josh Kaiser — the best! ; working with Josh to figure out the scale, the textures, the roots and the curly elements to hold the paper leaves; visiting an annodizing facility to explore coating/coloring it; unveiling it at a board meeting, and then seeing it in action at William Ishmael’s cultivation event. I grew up loving fabrics and colors and became an expert in print design. It was a pleasure stretching my knowledge to make this sculpture happen for Sacramento Tree Foundation. I appreciate the opportunity, Josh’s exceptional work, and the pride I feel when I see it on display at the STF office. You’re invited to see it there, but I recommend you join and add a leaf to the tree. Visit sactree.com or call 916.924.8733 to volunteer or join.